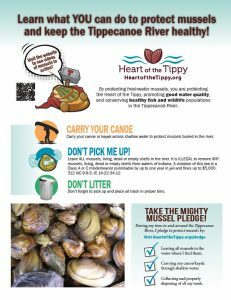 The HEARTOFTHETIPPY campaign has developed many outreach and education materials that can be used by teachers, educators, residents, recreationists, kids, and business owners to learn more about freshwater mussels, why they are important, and what you can do to protect them. Please download and print any of these materials that would be helpful to you. Brochures: One is designed for the general public and the other for anglers! This activity is designed to teach 4th and 5th graders how human impacts to the environment affect water quality and indicator species. 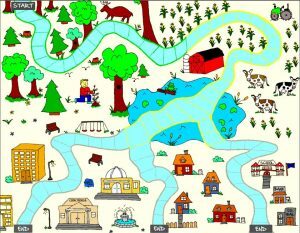 Click on the game board image to download the instructions and materials needed to produce this activity and game. Flyer: If you own a canoe/kayak rental business or are planning a float event, use this flyer to help remind recreationists how they can protect freshwater mussels and keep the Tippecanoe River healthy!